I like this saying. I REALLY like it. We set goals all the time. Sometimes those goals result in less than satisfactory outcomes. Have you ever wondered why that is? One explanation is because the goals have been left open-ended. Not giving our objective a target to completion leads to unfulfilled aspirations and ambitions. Here are five reasons that goals need deadlines. 1. Deadlines avoid procrastination. What is the first thing you think about when there is something to do? Do you try to find a way to put it off? Many people do exactly that all the time. The car is making a funny noise but it still runs so you put off getting it looked at by a mechanic. Then, one day it doesn’t run and the need is immediate. Without a deadline, the achievement of a goal can drag on forever. 2. Deadlines hold you accountable. Every goal needs a way that it can be tracked or measured. When there is a set time or due date for your goals, it’s easier to plan how you will actually achieve it. Setting several deadlines for small goals within a larger goal increases your chances of success. Also, others can help you stay on track when there is a deadline. 3. Deadlines help us visualize our goals. Everything that begins must have an ending. It may be close at hand or in the distant future. Either way, a conclusion is coming. The same is true with goals. Let’s say that you are running a race. In the middle, you get winded and your legs start to hurt. If the length of the race was unknown you might be tempted to quit. Knowing that the finish line will finally come into view, you push on to make it to the end. 4. 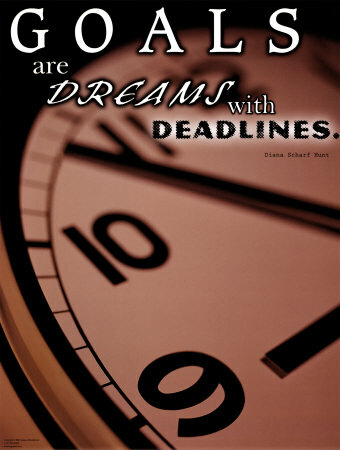 Deadlines turn a dream into a reality. When the idea of a goal is formed in our head, it can easily be pushed away and forgotten. No one knew about it but us and that’s how it will remain. Now that we have assigned a deadline to our “dream” it has become a goal. To remember the deadline, our goal gets written down somewhere so we can see it every day. 5. Deadlines encourage us to focus on our goals. We’ve established that without deadlines it’s all too easy to procrastinate. Having a deadline encourages us to get it into gear and start working on our goal. When we know we must have something done by a certain time, it can be motivating, especially if someone else is also watching our progress. Goals need deadlines. Without them, there is no way to tell if we are getting closer to achieving our goal. Goals will never reach their full potential of greatness if we don’t map out a plan to get there. And of course, goals are in stone and deadlines are in sand; so what I don’t achieve this quarter becomes next quarter’s goal! But, I’ll raise my stakes. My goal for next quarter is Ruby Star. I’ve never achieved that before. Goal for Seminar year? 🙂 I want to be a director that drives free. Director by Career Conference would be great! But, if not, definitely by Seminar. My goal for the quarter is to sell 1800 wholesale!! Shades – the great thing is what you accomplished this quarter with your sales. That’s wonderful! Dust is not collecting on your shelf. No kidding… Congratulations! The one thing I know you and I (we) appreciate is getting to start again on the 16th, with a brand new goal in mind. I just love that! I know you must too, right?!! What a difference a new quarter can make! Place that deadline in stone too! Reach UP!!! I can see your achievements ahead of you! Vision!!! Dream set. Goal set. Deadline set. Plan in place. We’ll show up and go to work when we say we will to achieve the goal, a dream with a deadline before us. Look out next quarter!!! Love your photo for this post. It really says it all. I love new quarters too. A fresh start, a new beginning. Ruby star is my goal, I will shoot for Diamond, but Ruby will be my bottom line this quarter. I am in the middle of a lot of change, so have a lot of work to do before that deadline.